I’ve not posted here for many weeks and that’s not good. However, please note that in the ensuring time since I last posted, I’ve managed to get two more ebooks posted for Kindle and Nook. They’ll be available on other platforms shortly. MOONS OF THE BLOOD HUNT is the sequel to MOONSLASHER. It was almost published back in the 90s, but the publisher wanted it shortened and I didn’t want to shorten it. Thus, it languished in my computer until now. A friend told me that it’s “scary.” Well, I should hope so. I am a horror writer and I do aim to scare the bejesus people. 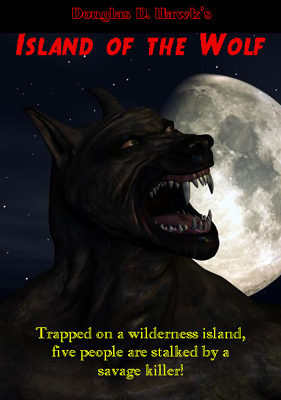 ISLAND OF THE WOLF is a novella, about 30,000 words and as such, it’s selling for a mere 99 cents. And speaking of scary…. Five people, strangers to one another, awaken on a plane flying over the Canadian wilderness. The cockpit door is sealed shut and when they land on a vast lake, the plane docks and the pilot orders them ashore at gunpoint. For the next three nights, they attempt to survive the savage creature that pursues them on an island from which there is no escape. Believe me, for 99 cents, loosing a few night’s sleep will be worth it.